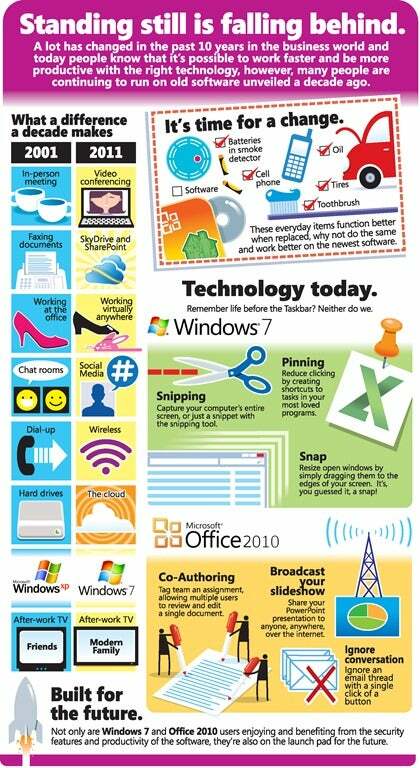 Microsoft is eager for Windows XP, its 10-year-old operating system, to fade into computing history. The sooner the better, in fact. But for that to happen, the Redmond company needs millions of XP users to drop creaky, old XP and migrate (hopefully) to Windows 7, or even to Windows 8, which won't arrive until next year. Windows XP's demise may be proceeding steadily, but Redmond wants to pick up the pace. According to analytics firm Net Applications, XP finished September 2011 with a 50.5 percent share of all desktop operating systems, a drop of nearly 10 percent from just ten months earlier. Microsoft has made it clear in recent weeks that it will be ending support for XP in April 2014, a hard deadline the company hopes will light a fire under enterprise customers still running XP on aging iron. Redmond usually supports its operating systems for 10 years after their introduction. However, it made an exception in XP's case, extending the OS's lifespan by three years due to XP's popularity in the enterprise market. "Think about phones – would you even carry a flip phone now? Think about music-- would you still claim that Destiny's Child is your top favorite band (if you or your wayward self ever did)? Think about hair--are you still rocking the same cut? Why then are you still on Windows XP when Windows 7 is so much better?" The secret to XP's longevity probably has as much to do with the tepid--and in many cases, downright hostile--response to its successor, Windows Vista, as it does with XP's own reliability and stability. Enterprise users largely shunned Vista, which suffered from security and incompatibility issues right out of the gate. The arrival of Windows 7 in 2009 brought the rapid demise of Vista. Even better for Microsoft, the new OS provided a reliable upgrade path for its enterprise customers. Windows 7 currently has more than 32 percent of the desktop operating system market, and its share is rising steadily, according to Net Applications.